How businesses and other organizations can improve their performance by tapping the power of differences in how people think What if workforce diversity is more than simply the right thing to do in order to make society more integrated and just? What if diversity can also improve the bottom line of businesses and other organizations facing complex challenges in the knowledge economy? It can. And The Diversity Bonus shows how and why. 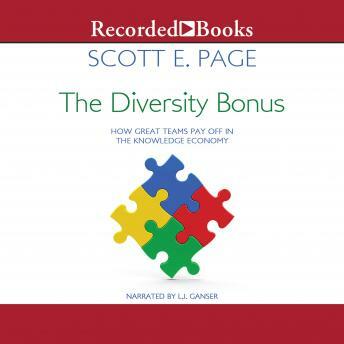 Scott Page, a leading thinker, writer, and speaker whose ideas and advice are sought after by corporations, nonprofits, universities, and governments around the world, makes a clear and compellingly pragmatic case for diversity and inclusion. He presents overwhelming evidence that teams that include different kinds of thinkers outperform homogenous groups on complex tasks, producing what he calls "diversity bonuses." These bonuses include improved problem solving, increased innovation, and more accurate predictions--all of which lead to better performance and results. Page shows that various types of cognitive diversity--differences in how people perceive, encode, analyze, and organize the same information and experiences--are linked to better outcomes. He then describes how these cognitive differences are influenced by other kinds of diversity, including racial and gender differences--in other words, identity diversity. Identity diversity, therefore, can also produce bonuses. Drawing on research in economics, psychology, computer science, and many other fields, The Diversity Bonus also tells the stories of people and organizations that have tapped the power of diversity to solve complex problems. And the book includes a challenging response from Katherine Phillips of the Columbia Business School. The result changes the way we think about diversity in the workplace--and far beyond it. Author bio: Scott E. Page is the Leonid Hurwicz Collegiate Professor of Complex Systems, Political Science, and Economics at the University of Michigan and an external faculty member of the Santa Fe Institute. The recipient of a Guggenheim Fellowship and a member of the American Academy of Arts and Sciences, he is the author of The Difference: How the Power of Diversity Creates Better Groups, Firms, Schools, and Societies and Diversity and Complexity (both Princeton). He has been a featured speaker at Davos as well as at organizations such as Google, Bloomberg, BlackRock, Boeing, and NASA.